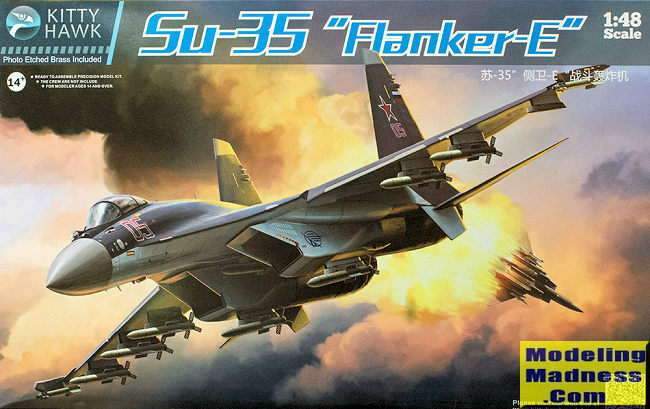 In 2003, even as Russia aimed to export the Su-27M, Sukhoi launched a project to produce a fighter to bridge the gap between upgraded variants of the Su-27 and Su-30MK, and Russia's fifth-generation Sukhoi PAK FA. 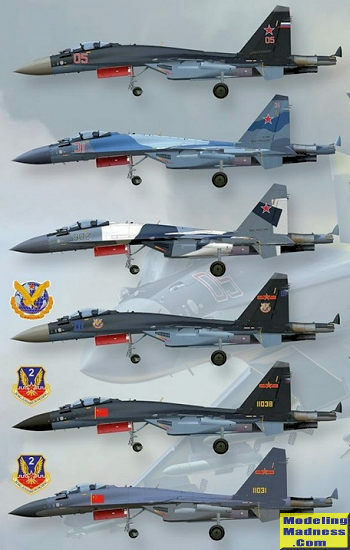 The project's aim was a second modernization of the Su-27 airframe (hence its classification as a "4++ generation fighter") by incorporating several characteristics that would be implemented on the PAK FA. Additionally, the aircraft was to be an alternative to the Su-30 family on the export market. The design phase was to take place until 2007, when it would be available for sale. It was later reported that the programme was launched due to concerns that the PAK FA project would encounter funding shortages. The project's in-house designation is T-10BM (Bolshaya Modernizatsiya, "Big Modernization") while the aircraft is marketed as the Su-35. While the aircraft maintains a strong superficial resemblance to the Su-27, the airframe, avionics, propulsion and weapons systems of the Su-35 have been thoroughly overhauled. Technological advancements have produced more compact and lighter hardware, such as the radar, shifting the centre of gravity to the aircraft's rear. These improvements removed the need for canards and saw the abandonment of the "tandem triplane" featured on several Su-27 derivatives. Also omitted was the Su-27's dorsal airbrake, which was replaced by differential deflection of the vertical stabilizers. Other aerodynamic refinements include a height reduction of the vertical stabilizers, a smaller aft-cockpit hump, and shorter rearward-projecting "sting". The reinforced airframe sees extensive use of titanium alloys, increasing its durability to some 30 years or 6,000 service hours, and raising the maximum takeoff weight to 34.5 tonnes. Internal fuel capacity was increased by more than 20% to 11.5 tonnes, and could be raised to 14.5 tonnes with the addition of drop tanks; in-flight refueling can also be used to extend missions. Sukhoi has overhauled the avionics suite, at the heart of which is the information management system that enhances man-machine interaction. The system, which has two digital computers, collects and processes data from various tactical and flight-control systems and presents the relevant information to the pilot through the two main multi-function displays, which, together with three secondary MFDs, form the glass cockpit. The aircraft features many other upgrades to its avionics and electronic systems, including digital fly-by-wire flight-control system, and the pilot is equipped with a head-up display and night-vision goggles. The Su-35 employs an Irbis-E passive electronically scanned array radar that constitutes an essential component of the aircraft's fire-control system. The radar is capable of detecting a 3-square-metre (32 sq ft) aerial target at a distance of 400 km (250 mi), and can track 30 airborne targets and engage eight of them at the same time. Su-35S uses the N135 Irbis passive antenna array with electronic scanning radar for improved locating. The radar can also map the ground using a variety of modes, including the synthetic aperture mode. The Irbis-E is complemented by an OLS-35 optoelectronic targeting system that provides laser ranging, TV, Infra-red search and track (IRST) functionality. The Su-35 is compatible with a multitude of long- and short-range air-to-air missiles, precision and unguided air-to-ground weaponry that include missiles, fuel-air bombs and rockets. A maximum weapon payload of 8 tonnes can be carried on the fourteen hardpoints. The fighter may use missiles with a range of up to 300 km. The Su-35 is powered by a pair of izdeliye (Product) 117S (AL-41F1S) turbofan engines. Developed jointly by Sukhoi, NPO Saturn and UMPO, the engine is a heavily upgraded AL-31F variant, and draws on the design of the fifth-generation PAK FA's Saturn 117 (AL-41F1) engines. Its thrust output is estimated at 142 kN (31,900 lbf), 20 kN (4,500 lbf) more than the Su-27M's AL-31F. It has a service life of 4,000 hours, compared to the AL-31F's 1,500; the two engines feature thrust-vectoring capability. Each thrust vectoring (TVC) nozzle has its rotational axis canted at an angle, similar to the configuration on the Su-30MKI. The thrust vectoring nozzles operate in one plane for pitch, but the canting allows the aircraft to produce both roll and yaw by vectoring each engine nozzle differently. A similar thrust vectoring system is also implemented on the PAK FA. The engine may give the Su-35 limited supercruise capability, or sustained supersonic speed without the use of afterburners. Radar-absorbent material is applied to the engine inlets and the front stages of the engine compressor to halve the Su-35's frontal radar cross-section (RCS); the canopy was also modified to deflect radar waves. We have come to expect a lot from Kitty Hawk's kits and this one is no exception when it comes to features and options. First thing you notice is that the box is huge. That is because there are no fewer than eight full size sprues as well as an upper and lower fuselage and a clear sprue. A photo etch fret is also included. I particularly like that there is no separate cockpit section as you see on some Flanker kits. Kitty Hawk has also properly produced the correct upper fuselage section without the speed brake of the earlier Flanker varieties. Not including p.e., there are a dozen pieces to the pilot's seat along. P.e. is used for the harness. The cockpit tub is assembled from several flat pieces and includes separate console instrument panels. Decals are provided for these as well as for the instrument panel, though the raised detail on these is superb. Even the area behind the seat is nicely detailed. A HOTAS and rudder pedals are provided with more photo etch going onto the gunsight area. All of the wheel wells are constructed of separate walls and there is some piping detals to add. One also installs the wells for the refueling probe and the gun prior to closing the halves. There are a few holes to open up so don't miss those. Holes for all the underside pylons have already been opened up for you so if you want to do a clean airframe, break out the filler. Exhaust nozzles are nicely done and can only be built in the neutral position. If you recall, the Su-35 has variable nozzles and it is not uncommon for the engine to shut down with those at an angle. The separate tail cone section is designed so that the parachute compartment door is modeled open. Wings have separate flaps and slats though the slats are to be modeled in the neutral position from the way it looks in the instructions. In the front a full radar is provided so you can leave the nose cone off to show this. While no nose weight is indicated, when I built my 1/72 Su-35, I found it would tail sit if prompted so some weight in the nose would be a wise choice. The air refueling probe is shown modeled extended, though it should be no problem to cut it down to where it is flush. For the intakes, there is a section of p.e. for the inside and on the bottom the bypass doors have parts for both an operating and shut down engines. Landing gear is quite nicely detailed and while the main gear is pretty basic, the nose gear has a lot of pieces so follow the instructions carefully. Some of the p.e.is used here as well. Note that the complete interior of the gear doors is red so I'd leave these off until the very end of the build. 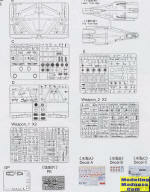 The Su-35 has a ton of weapons pylons. There are four under each wing, one under each engine intake and one on the centerline. Photo etch is provided for the anti-sway braces. 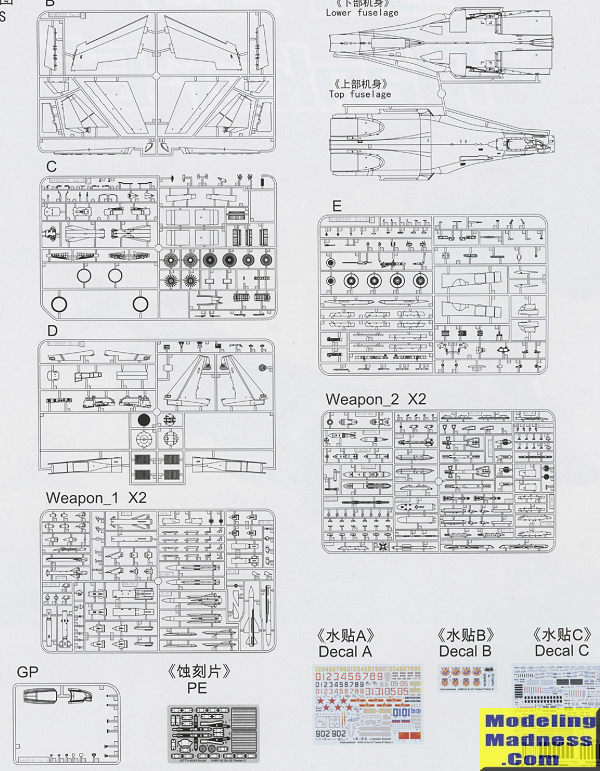 A feature of all Kitty Hawk Russian aircraft kits is a plet hora of weapons. I'd say that nearly half the sprues are dedicated to ordnance. Benefit is that the same sprues can be used in different kits and you get more things that go 'boom' than you could possibly put on one aircraft. Instructions are very nicely done and come in Kitty Hawk's booklet style. Color info is Gunze with generic names. I find it interesting that they chose Air Superiority Blue for the cockpit, but that is probably because there is no Russian Interior shade in the Gunze line. Markings are for six aircraft. Three are Russian and three are Chinese. The rather interesting solid upper color is shown as a mixture of Propeller Color and RLM 75. The shades for the Splinter camo and the standard Flanker scheme are generally available from other paint lines if you don't want to use Gunze approximations. 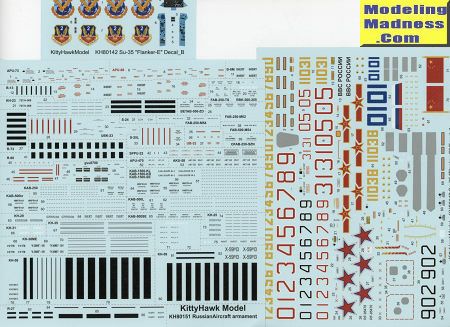 There are three decal sheets of varying sizes with the largest being data markings for the weapons. 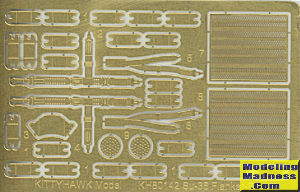 Kitty Hawk decals are quite usable and while they are also very thin, careful application will give the best results. Thanks to Kitty Hawk models for the preview kit. You can find this kit at your favorite hobby shop or on-line retailer.